Wanjiku Mwaurah is an African pearl. She has graced numerous performance stages; she has performed alongside some of the leading African poets like Mphutlane Wa Bofelo (South Africa), Qbibo Intalektual (Swaziland) Napo Masheane (South Africa) at the Johannesburg Arts Alive international festival, held in Johannesburg in 2010. She also graced the stage at Arusha Poetry club among other events. She goes beyond poetry and has been heartily involved in awareness raising campaigns for the cerebral palsy condition (art4acause – 2010), while playing mentor and role model to many upcoming artists in the field. She has achieved a lot; having been crowned Slam Africa Queen (Aug 2009), named as the featured poet severally at Kwani Open Mic, Poetry Spot, Jukwaani Festival in 2009, Sawa Sawa Festival 2011, SAMOSA festival 2012 and was one of the guest artists at a highly charged poetry night at the Story Moja Hay Festival 2012. Her book, The Flow of My Soul is a bridge between her spoken word and reflections of a times before her. 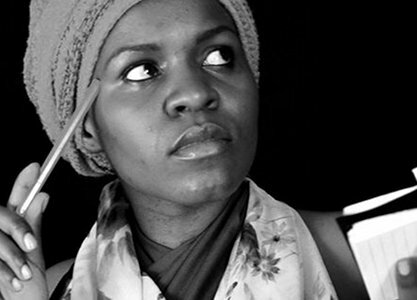 Currently, she writes screen plays and facilitates poetry workshops as well as performing.